Condos and Townhomes in Branson offer everything you need to enjoy a luxurious and comfortable stay during your spring vacation. Thousand Hills is the leading provider of cozy accommodation in the heart of Branson. For almost two decades, Thousand Hills Golf Resort has provided golf front condos, log cabins, townhomes and other vacation accommodation for nightly rental. The resort is home to an award-winning 18-hole golf course carved out of the Ozark Hills. The resort features function rooms that are great for family reunions, business meetings, and more. Thousand Hills Golf Resort is proud for their dedication in serving guests with excellent service allowing them to enjoy a wonderful stay. Whether you stay in one of their condos, cabins, or townhomes in Branson, play a round of golf, or hold a party, you are considered a part of their family guests. All beautifully located near the golf course in Branson that’s popular for both visitors and locals alike, the condos and townhomes are available in a variety of sizes, and features an array of great amenities. Thousand Hills has three- and five-bedroom townhomes that are especially luxurious and very popular. Condo units at Thousand Hills are available in one to four bedroom sizes. The one room queen suite is pretty and cozy place with a convenient kitchenette. Thousand Hills properties feature numerous amenities including indoor and outdoor swimming pools, an excellent fitness center, tennis and basketball courts, shuffleboard, game room with arcade games, and more. All the features that you’ll enjoy in condo and townhome lodging can be found at Thousand Hills Golf Resort, and every unit has been beautifully decorated. Everything you need to enjoy in Branson such as exciting attractions, fabulous shows, and great places to eat and shop are all accessible from your accommodation. When it comes to finding a spacious place to stay in Branson, make a perfect decision by choosing Thousand Hills Townhomes. The three bedroom townhome is one of the largest accommodation units at Thousand Hills Golf Resort. All living rooms of the townhome feature queen sized sofa sleeper, gas fire places and private patios with gas grills for your entertainment pleasure. 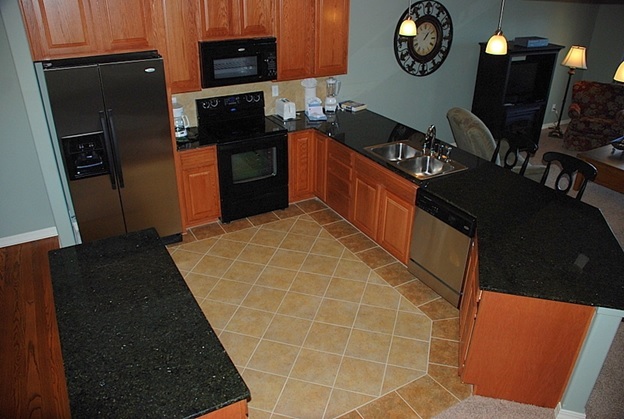 The fully furnished kitchen features granite counter tops, including modern appliances such as fridge, microwave oven, washer/dryer units and premium kitchen packages. The five bedroom townhomes at Thousand Hills are described as roomy, large, and spacious. There’s no other accommodation in the area that has ability to accommodate twelve people in such luxury including queen sized sofa sleeper. These extra-large townhomes at Thousand Hills have five bedrooms and five full bathrooms. This spacious townhome features a master bathroom with a whirlpool tub and separate walk-in shower. It also features an opulent winding staircase that extends upward to the additional four bedrooms on the second level. All bedrooms feature luxury bedding with premium triple sheeting and various pillow types. Condos and townhomes in Branson are some of the best accommodations of Thousand Hills that provide guests a luxurious and comfortable stay.